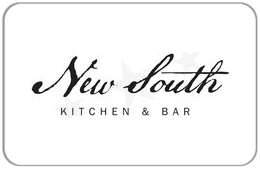 New South Kitchen & Bar gift cards are perfect for any occasion! They’re available for purchase at our restaurant location and also online for your convenience. Our seasonal, ingredient driven menu gives us a great opportunity to spotlight some of the finest ingredients the Carolinas have to offer. We take great pride in supporting family owned farms that embrace sustainable all natural farming methods. All of the beef, pork and poultry we serve are raised with no antibiotics or artificial growth hormones. And all of our seafood is sustainably fished or farmed in the waters of the Carolinas. Whenever possible we purchase our produce from farms surrounding Charlotte. We feel that utilizing as many local products as possible produces a better tasting meal, healthier guests and a stronger community. Enjoy!